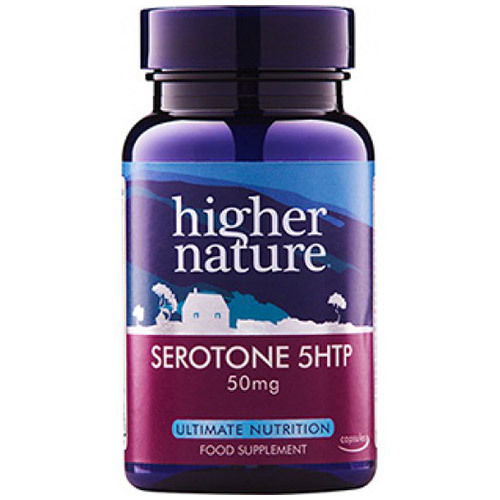 Serotone provides the natural amino acid 5HTP and may help maintain a balanced outlook and a relaxed approach to life. The neurotransmitter, 5-hydroxy-tryptophan (5HTP) is a compound created in the body which is used to regulate serotonin levels in brain and central nervous system. 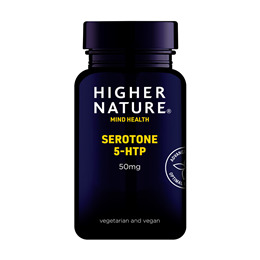 5HTP is the less well known cousin of serotonin (5HT). 5HTP can help maintain a balanced outlook and may help support healthy weight management and sleep patterns. Bulking agent: rice bran; capsule: hydroxypropyl mathylcellulose (carrageenan)*; L-5-hydroxytryptophan, niacin (as nicotinamide), zinc citrate, pyridoxal-5-phosphate,pyridoxine hydrochloride, anti-caking agent: silicon dioxide; anti-caking agent: magnesium stearate*; folic acid, biotin. Take 1 - 2 capsules a day, preferably before bed, with a carbohydrate snack, or as advised by a health professional. Not advisable if pregnant or taking fenfluramine. If gastro-intestinal discomfort occurs, reduce intake. Care should also be taken if being prescribed SSRIs. Below are reviews of Serotone - 5HTP - 90 x 50mg Vegicaps by bodykind customers. If you have tried this product we'd love to hear what you think so please leave a review. Excellent product.Helps to keep my mind calm. Question about Serotone - 5HTP - 90 x 50mg Vegicaps Can I take 5-HTP alongside my prescribed antidepressants? 5-HTP should not be taken with antidepressants, weight-control drugs or other serotonin-modifying agents including Carbidopa, Carbidopa/Levodopa, Citalopram, Escitalopram, Fluoxetine, Fluvoxamine, Paroxetine, Selegiline, Sertraline, Sibutramine, Sumatriptan, Tramadol, Venlafaxine, Zolmitriptan, Zolpidem. Question about Serotone - 5HTP - 30 x 50mg Vegicaps Can I take 5-HTP alongside my prescribed antidepressants?